My husband and I are quite certain our honeymoon was the best ever! We really enjoy traveling, especially to places that are off-the-beaten path. Since we've been together we've ventured to Vietnam, Indonesia, Malaysia, Portugal, Spain, England, Iceland (where we got engaged!) and Norway. In choosing a honeymoon destination we were stumped. On the recommendation of a friend, we bought the 'Lonely Planet Best of 2009 Travel' book, hoping for inspiration. One of the 'Best Countries to Visit' was Georgia—the book specifically mentioned the annual food and wine festival (Tbilisoba). We didn't even know where Georgia was exactly, let alone what would be interesting about it, so we did more research. Besides claiming to have invented wine, Georgians are very proud of their food and are known for their friendliness. In addition to travel, one of our passions is food. We love to eat and discover new foods and new food cultures, so this was pretty exciting to us. We were sold, and decided to add Turkey to the itinerary, since Istanbul had long been on our list of places to visit. Our two weeks in each country were definitely not disappointing!! We spent September 29th until October 13th in Istanbul and a few other spots in turkey, then October 13th until the 29th exploring all over Georgia. We stayed at the fabulous Galata Tower hotel while in Istanbul, which was perfect for relaxing after the exhaustion of our wedding- huge plush beds, fluffy white robes and a balcony that overlooked the historical Galata Tower and bustling Beyoglu district of Istanbul. After almost a week in Istanbul, we flew to Efes (Ephesus) to see the ruins, and stayed at the Hotel Kalehan based on recommendations we read on virtualtourist.com. After a day of exploring the ruins at Ephesus, we then drove to Pamukkale to see the 'cotton castle', and stayed at the Allgau Hotel, again based on virtualtourist.com recommendations. Both these hotels were great. We then took a flight to Cappadocia for 2 nights, 3 days. We stayed at the Kaleban Hotel, which was an amazing experience. Cappadocia was definitely our favorite part of Turkey- we loved the desert feel, cave exploring, and staying in a cave hotel (a 9th century cave chapel) was magical! The place was very romantic and the food was outstanding. We also took a hot air balloon ride one morning, which was special to us because of the story behind it... When I was a kid, I had a Babar the Elephant book in which one of the characters got married. After the wedding, the happy couple took off for their honeymoon on a hot air balloon. I thus assumed that any and all honeymoons involved going on a hot air balloon ride. My mom coined the phrase a 'Honeyballoon' to describe it. 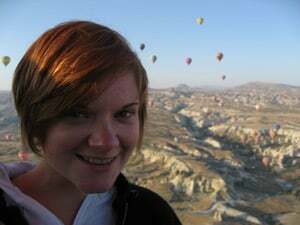 When we got to Cappadocia and found out that hot air balloon rides were popular my immediate reaction was "We have to go! We HAVE to!!" and of course we did. It was wonderful. After Cappadocia, we went back to Istanbul for a few more days, did some more exploring of the city, and then headed on to Georgia!! Georgia was the real treasure of the trip. We didn't really know what to expect, and we definitely didn't always know what was going on or what to do, but we loved it. We spent the first week in Tbilisi, the capital, getting our bearings and trying to understand a tiny bit of the beautiful Georgian language script. After a week there, eating, drinking, sightseeing, we hired a guide and a driver and left the city to go to the mountains up north and wine country down south. 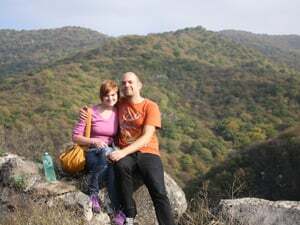 While in Tbilisi, we chose an unusual path for honeymooners-- staying at a homestay. However, we wanted a real Georgian experience, it was cheap and in a great location, and the owner Tina spoke good English, helping us out with where to go and what to do as much as she could. The homestay was called—you guessed it-- Tbilisi Homestay. On our excursion out of the city, the agency we hired to take us around booked our accommodation but we told them we wanted homestays as much as possible, and that's what we got, all except one night. They were all great- giving us a glimpse into Georgian homes and their simple lives. We had a lot of fun exploring with our guide, Lela, and our driver, Gocha. We started off up north in the Kazbegi region, to go hiking in the mountains and see the many churches and monasteries up there. It was stunningly beautiful, especially because we happened to be there in the midst of the autumn colors. Gorgeous. 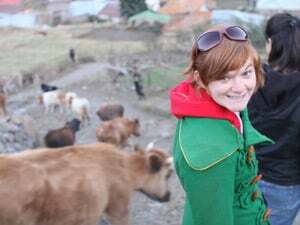 We hiked, saw our fill of churches, and enjoyed home cooked meals at our homestays for two days. After that, we headed down south to Kakheti, wine region! We're big wine fans, living in the Bay area, and we were happily stunned by the difference in wine production and style we saw in Georgia. Instead of aging wine in oak barrels, the wine ferments in large buried clay pots. Also, instead of filtering keeping the stems, seeds, skins out of their wine, the remnants are included, producing more tannic, fuller bodies whites and reds with a delicious and unique taste. Fun! We visited several wineries in Kakheti, also doing some hiking in between, and checking out the local churches and monasteries. Again we stuffed ourselves with homestay food and the family's homemade wine (the best! ), and Gocha and Lela led a traditional Georgian 'supra' (feast) complete with toasts and tradition. It was fabulous and heart warming. Another of our favorite moments of the trip out to the country was an afternoon stop at a roadside stand. Lela wanted us to try what she was calling 'blood oranges', which it turned out were persimmons. We love persimmons, so we were more than happy to buy some, as well as some Georgian traditional candy, and teach Lela the actual English word for persimmons (her English was superb overall- this was probably the only thing she was mistaken about). Anyway, as we were picking out our persimmons, a lady from next door appeared and insisted we come back into her garden, where she proceeded to pull out a bag and fill it with about 25 persimmons, for us. She said her son had died and she didn't have anyone to eat them anymore, so we should take them. It was so generous and touching. We thanked her profusely and headed out with our bounty, only to be stopped by the other neighbors, who wanted to show us their cha-cha distillery. Cha-cha is a Georgian grape-based liquor that varies in strength but is basically always liquor. It's made from the remnants after wine (those Georgians don't waste anything! ), poured into a huge vat and cooked repeatedly. Delicious! The neighbors proudly showed us the distillery, explained a little about it, and we happily took off, not realizing the stuff was ready and for sale! As we talked to Lela in the car we slowly came to terms with the fact that we had left empty-handed and were regretful and heavy hearted. However, Lela mentioned that we'd go that way the next day and could stop back by, so we relaxed and looked forward to it. The next day, indeed, Lela didn't forget and we stopped by, but unfortunately the men who had shown us around weren't there. All was not lost- the mother was happy to help us fill a bottle of cha-cha (with her 6 year old shyly hiding behind a huge vat of fermenting grape remains). However, she wouldn't let us pay a penny for the cha-cha. According to Lela, 'she is sorry her sons are not here to drink with you and eat with you, and can't explain the process' (although we got a perfectly adequate explanation from her). Such generosity from people that would be considered poor in our country. It was amazing and really touching. After we left wine country, we had a last trek to David Gareja monastery on the border of Azerbaijan. Spookily beautiful, we hiked up to the monastery with Lela, taking in her detailed historical recounts, and were saddened to see the parts of the monastery that were destroyed by an earthquake and then Russian target practice. After our hike and picnic, we headed back to the city to relax for the evening at Tina's homestay again. The weekend after our trip out to the country, we had set aside the whole weekend for Tbilisoba events! We really had no idea what was going to happen, or where we should go, and we had discovered in Georgia before that you really can't tell whether some event is going to be huge or tiny or confusing or completely non-existent. Well, fortunately, shortly after we left our homestay on Saturday morning, we ran into a huge display of free fruit in the street. ?!?!? Okay, sure! All the restaurants in the area had decorated with fruit and vegetable displays and all the servers were wearing traditional Georgian costume. It was so fun and festive! Since the festival is focused around the wine harvest (and the harvest in general), there was food and wine everywhere. All the kids were getting their faces painted and wearing silly hats; there were stalls with food, drinks, games, whatever your heart might desire for sale, and in the middle of one of the cul de sacs, there were traditional Georgian dancers & singers, as well as a huge wine press full of grapes, and folks pressing the wine with their wellies or bare feet. So fun! We watched the wine pressing and dancers for a while, then headed on to get a snack of grilled pork and bread (which every restaurant was selling on the street), and of course wine! The day was super fun, and we basically did the same thing the next day, enjoying ourselves and each other and the friendly Georgian folk. 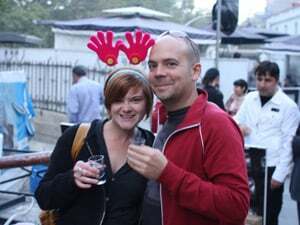 That evening was probably our favorite night out in Tbilisi. We wandered into a restaurant just down the street from our homestay, which Lela and Gocha had recommended. They had said the food was good and there was 'Georgian dancing'. Well, we took that to mean that there would be traditional Georgian dancing on a stage (which there may well be some nights), but what we saw was the patrons of the resturant dancing! There was traditional AND modern music playing, and moves we had never seen, executed perfectly on the floor of the restaurant, the tables pushed away to make an impromptu dance floor! We ate and drank and eventually got out on the dance floor (even though we had no idea how to do the traditional dances), and as I was being shown how to dance by some random ladies, Greg was pulled up to a table full of men toasting each other and singing! The one guy up there who spoke pretty good English introduced himself and his friends (it was their high school reunion), and welcomed us to eat and drink with them. They were so generous and kind- toasting us and forcing food and drinks upon us, dancing with us and singing for us. It was really special and FUN to meet these people and get a glimpse of their celebratory spirit and kindness. That was a great ending to a great trip- we had just one more day in Tbilisi, a night stopover in Turkey, and then were back in the States and to 'real' life. All in all we could not have had a better honeymoon, enjoying each other and a culture we had no idea existed 6 months prior to our wedding. We spent a total of about 8,000 on the honeymoon, including airfare and hotels, and most of that was covered by the generosity of our family and friends through Traveler’s Joy. I would highly recommend Turkey to any traveler, especially Istanbul and Cappadocia, and would highly recommend Georgia to adventurous/off-the-beaten-path travelers, in particular Foodies or wine fans.